One of our reference amps here at the Tweak Shop. 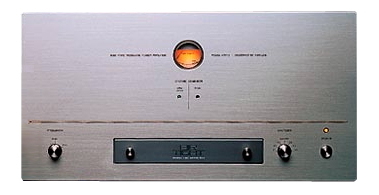 A superb piece by any standard, the ATM-2 uses KT-88 output tubes. (The ATM-2s are outfitted, at the factory, with Chinese KT-88s that have gone through a rigorous burn-in procedure. This consists of preliminary testing for defects and overall selection for sound and performance matching, after which the tubes are placed in an ATM-2 on the test bench and run continuously for 100 hours. This is followed by further testing and rematching, after which they are again placed in an ATM-2 and run for another 100 hours. The tubes are then matched to a specific ATM-2 from the production line. Set-up and tube biasing are a snap. There are even two sets of inputs, allowing you to use a line-level source, i.e., CD player, directly into the amplifier using the amps left and right attenuators for level control. Air Tight's flagship is more than worthy of the title. This is an example of true "no holds barred" design. Every aspect of Miura-san's approach to circuitry, resonance control, magnetic shielding, chassis stability, and, of course, beautiful aesthetics, have been put into play. The incredible power output (180 Watts per side in the stereo version; 330 Watts for each mono block) comes from the use of six 6550s per channel (or 12 in mono block), each with its own individually-assigned cathode follower. Thus, subtle variations in tube performance can be easily optimised. Separating the signal amplification stage (over 100 lbs!) from the massive power supply (over 140 lbs!!) acheives an unparalleled purity of the audio signal path, still carried, at Miura-san's insistance, via hand-soldered, point-to-point wiring without dreaded printed circuit boards. The large internal volume also means that heat dissipation can be effectively dealt with without the use of noisy, field-generating fans. In the vast world of modern vacuum tube amplification, this is a "statement", and one that will not soon be equalled. Call for pricing and availability. 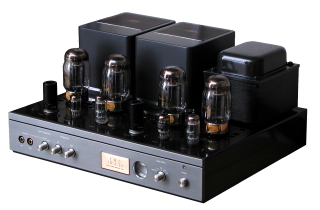 This beautiful component is Miura-san's first foray into 300B tube amp production under the Air Tight logo. With the same approach to straightforward circuit design and layout and meticulous construction standards as his other offerings, the ATM-300 brings the magic of the legendary 300B triode tube to a new level of musicality. 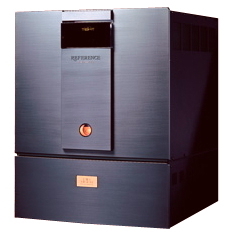 Using a single 300B per channel, the amp delivers 8 Watts per side of Class A triode purity (obviously, proper 'speaker selection is critical). Key to the superb performance is Mr. Miura's choice of the Tamura transformers for output power, making for stable, fuss-free operation (the unit is even self-biasing, although a handy bias-current meter lets you check up on the state of the tubes while playing). The amp also offers a 3-position (0dB, 4dB, 6dB) "damping control" to optimize negative feedback. The unit comes complete with Sovtek 300B EH Golds for $8,795.00. 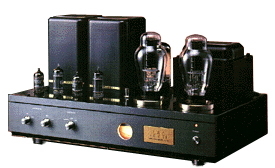 Mr. Miura's classic mono-block amplifiers. Designed to easily switch between pure, 55 Watts per channel triode operation (our favorite, most musically transparent mode) or 110 Watts per channel Ultra-Linear mode (for more demanding loudspeaker loads), the ATM-3s are beloved by discerning audiophiles everywhere. $18,195.00 / pair.